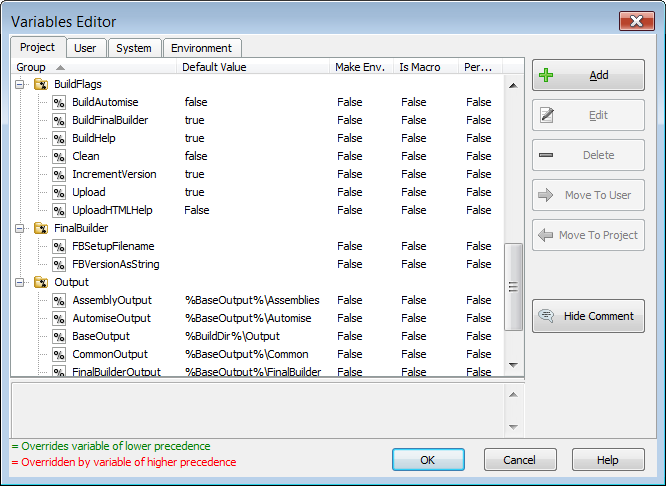 Variables in FinalBuilder are the key to making your build dynamic. Variables can be used in nearly every text property of the actions, for example in fields that specify file paths, directories etc. Variables can be modified at run time by either using the Set Variable Action or the Active Scripting events. 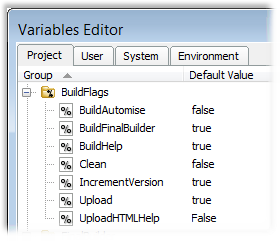 Variables defined in FinalBuilder can be referenced in active script just like normal (e.g VBScript or JScript) variables. Only Project and User variables can be modified. Project and User Variables can be made available as environment variables to applications that are executed by FinalBuilder. The Macro option turns the Variable in the a function that always re-evaluates it's default value expression when it's value is requested. Non macro variables evaluate their default values once at the start of a build.